Surprise! 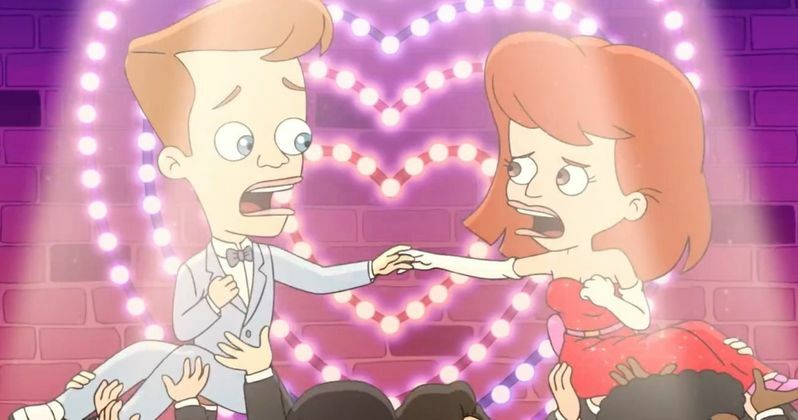 Netflix has just announced that Big Mouth will be releasing a Valentine's Day special, just in time to drum up some of that awkwardness that we all felt in our school years ahead of facing down the annual love-filled holiday as an adult. The special is titled My Furry Valentine and, to go along with the announcement, Netflix has already released a trailer for the special, which brings what we've come to expect from this series and drapes it all over V-Day in glorious, and terribly inappropriate, fashion. As an added bonus, they aren't going to make us wait long to see it, as the special is scheduled to debut on February 8. The trailer, even with the show's trademark absurdist representations of our coming-of-age-anxieties, manages to capture the stress and awkward nature of Valentine's Day in school. Is this the right time to confess our youthful love to someone we care about? How best to go about that? Does this shirt look ridiculous? It's all covered. But, no question, the highlight comes (pun intended) at the end of the trailer with perhaps the best spoof of the infamous scene from When Harry Met Sally that we've ever seen. Big Mouth hails from creators Nick Kroll and Andrew Goldberg, who just so happen to be best friends in real life. The series deals with the nightmare that is teenage puberty. The voice cast includes Nick Kroll, John Mulaney, Maya Rudolph, Jason Mantzoukas, Jordan Peele, Fred Armisen, Jenny Slate, Jessi Klein, Gina Rodriguez and David Thewlis. Mark Levin and Jennifer Flackett co-created the series alongside Kroll and Goldberg, who all serve as executive producers. Not only is Netflix spending an estimated 12 billion on content this year, but they are specifically betting big on animation. They are now shifting to do more of their animation in-house in order to take more control over the production process. Some of the other hit animated offerings in their lineup include BoJack Horseman, F is For Family, Castlevania, Disenchantment and Voltron: Legendary Defenders, just to name a few. Big Mouth season 2 debuted in October and it has asserted itself as not only one of the brightest spots in Netflix's growing animated lineup, but perhaps as one of the best animated shows running right now. Both season 1 and season 2 have a perfect, unblemished 100 percent approval rating from critics on Rotten Tomatoes. While Netflix is notoriously stingy when it comes to revealing any sort of ratings figures, they clearly are happy with the results so far, as they recently renewed the half-hour animated comedy for a third season. The expectation is that season 3 will arrive sometime in 2019, but that has yet to be confirmed. This special should help tide us over until then. Be sure to check out the trailer for My Furry Valentine from the Netflix streaming YouTube channel below.